It’s very hard to forget puppy dog eyes. 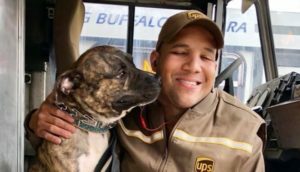 One UPS driver learned that the hard way when a shelter dog jumped into his truck. Jason Coronado was making his delivery rounds when a dog from the Buffalo City Animal Shelter hopped into his truck and didn’t want to leave. After a few days, Coronado couldn’t forget about the little pitbull-terrier mix and decided to adopt the dog. “He is probably my idea of the perfect dog,” he says. 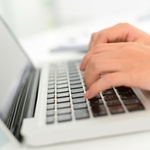 “I wanted him to have a good home.” Read more. A group of NICU nurses at Mercy Children’s Hospital in Missouri won a $10,000 lottery ticket and without hesitation, gave the money to two deserving colleagues… Gretchen Pos, who had just lost her son to suicide and Dr. Casey Orellana, whose husband has been fighting cancer. The two women were not surprised by their colleagues’ generosity, but were very grateful. One of the nurses said the gesture is just indicative of their support for one another. “We have a very strong bond and I think this just goes to show that we’re always here for each other, no matter what.” Read more. Riley Morrison, a basketball player and fan of Stephen Curry, was disappointed to learn that his shoes, the Curry 5’s, were only available in boys’ sizes. Instead of finding a different shoe, Riley wrote a note to Curry asking him to make them available to girls, because girls like to play basketball as well. After a photo of the letter went viral, Curry responded with his own letter saying he’s fixing the problem and will be sending Riley her own pair of the shoes. He also extended a special invitation, a request for Riley to celebrate International Women’s Day with him next year. Read more. 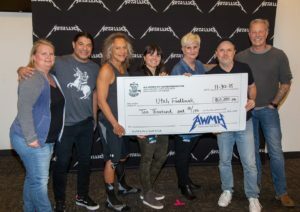 Heavy metal band Metallica has pledged to donate to a local food bank along every stop of their current tour as part of their “All Within My Hands” Foundation. The band hopes to give back to the communities that have helped sustained the band for years. At one stop, they even donated $10,000 to the Utah Food Bank in Salt Lake City. Along with the donation providing 30,000 meals to the hungry in Utah, a portion of every ticket sold at the band’s show in Spokane will also benefit the state’s Second Harvest program. Read more. In the town of Severance, Colorado, a 9-year-old boy advocated for the repeal of an antiquated law banning snowball fights. Dane Best presented before his local town board, suggesting that the repeal will encourage children to play outside during the winter, and give his town a chance to play like the rest of the world. The law repeal succeeded with unanimous support. After all, what’s winter without snowball fights? Read more.